It stands to reason that Almighty God's selection of the Virgin Mary to be the Mother of God was not a random selection. In his wisdom, God selected not from the nobility but from the humble, thoroughly devout, daughter of equally devout parents whose names were Joachim and Anna. Tradition has it that Anna, childless for many years, reached a point in her life when just short of despair she prayed in earnest that God grant her a child with a promise that should her wish be fulfilled she would pledge the child to his holy Temple. It did not matter to Anna that the child granted her by God was a girl and, faithful to her word, she presented her daughter, given the name of Mary, to the holy Temple at the age of three, on the 21st of November. She remained in the house of God for twelve years, emerging at the age of fifteen with a purity and wholesomeness found in no other creature of God. By the time she had been released to her parents, the saintly Mary was not only a flawless maiden but in her twelve years had acquired the lore and religion of the deepest scholars, something usually denied a female child of those days. So much has been written of the Lord's mother that the concern here is for a glimpse into her life as a human being. 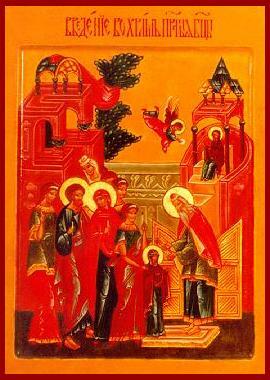 The Virgin Mary is looked upon by Orthodoxy as "Panagia," which translates into the all-encompassing saint. Greek Orthodox Christians need but one name and that name is "Panagia," carrying the full impact on the Christian faith as no other name can regardless of the language. The beginnings of Christianity were not the scattered remnants that somehow merged into a smattering, of ideologies. By divine intent the great religion of Christ stemmed from a tight circle which spread itself out as the greatest of human experiences. To begin with, the high priest entrusted with the care of Mary was Zacharias, who in turn was the father of St. John the Baptist, referred to as the prefiguration of the Messiah and the man who was to baptise Jesus Christ. Yet in her teens the Virgin Mary, in a story that cannot be told often enough, was visited by the Archangel Gabriel, sent by the Almighty himself to be told that she, a wisp of a girl, mortal but blessed, was to become the mother of the Son of God. There is every reason to believe that as electrifying as the news was, she received it with both joy and complete serenity. A girl can get excited by being elected "Queen of May" but to be "Queen of the Universe" must have been an anticipation not of excitement but the sublimest of joy, human or otherwise. It follows that both Joachim and Anna, as the grandparents so to speak, of the Son of God, are also venerated as saints of the Church, so much so that they are also known as the "Patron Saints of Pious Education," principally because of the twelve year course of study of religion of their daughter Mary. The Christian can make his own choice of his favourite among the four days of the year which are feast days of the Virgin Mary. These are the Birth of the Blessed Virgin Mary on September 8, the Presentation of the Virgin Mary on November 21, the Annunciation of the Virgin Mary on March 25, and the Dormition of the Virgin Mary on August 15. On the calendar of the Church, all four of these days are of equal importance. The world sees the Virgin Mary much as Michelangelo did when he carved out his famous Ficta in which a youthful looking Mary is holding the lifeless body of her crucified Son. Nowhere is she seen as an old woman, at least not at the age of a woman who is the mother of a thirty-three year old son. Among the Holy Land's most sacred shrines is the one at the base of the Garden of Gethsemane, the site of the agony of Christ. This shrine is dedicated to the Virgin Mary and her parents. After a descent down a cement stairway of about fifty steps, the tomb of Joachim is on the left and on the right of the tomb of his wife Anna. Some fifty steps below this is the empty tomb of the Virgin Mary since, like the Son of God, she ascended into heaven. Stories abound about the Virgin Mary but the truthful one that clings and shall do so forever is that in being the mother of the Son of God, she is the mother of the world. For this reason November 21 is one of Christianity's holiest feast days.